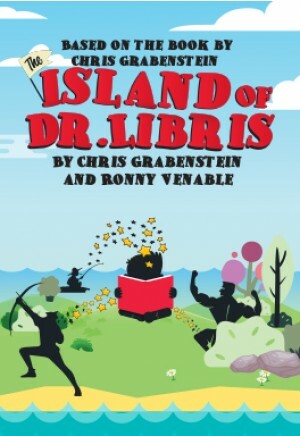 The Island of Dr. Libris celebrates the power of imagination with an action-packed adventure that shows that sometimes the real story starts after you close the book! What if your favorite characters came to life? Billy’s spending the summer in a lakeside cabin that belongs to the mysterious Dr. Libris. But something strange is going on. Besides the security cameras everywhere, there’s Dr. Libris’ private bookcase. Whenever Billy opens the classic books inside, he can hear sounds coming from the island in the middle of the lake. The clash of swords. The twang of arrows. The dialogue of characters. Sometimes he can even feel the ground shaking. It’s almost as if the stories he’s reading are coming to life! But that’s impossible … isn’t it? Before long, Dr. Libris’ island is populated by some of the most famous characters in all of literature: Hercules, Robin Hood, Maid Marian, The Three Musketeers, Tom Sawyer and Pollyanna. When these characters mingle, their plot lines get mixed up (and complicated by the arrival of a few comic book heroes and villains). It’s up to Billy and his magical imagination to come up with a happy ending for everybody, including himself! The Island of Dr. Libris harnesses the imaginative powers of live theatre, calling on the audience to use their imaginations along with Billy’s.